The Insurance Council of Australia has confirmed the cost of Debbie's damage is second to Cyclone Tracy which devastated Darwin in December, 1974. "It's the most expensive cyclone to have ever hit Queensland and nationally it is second only - in today's dollars - to Cyclone Tracy," ICA general manager of communications Campbell Fuller said. "It is the second most damaging on record." 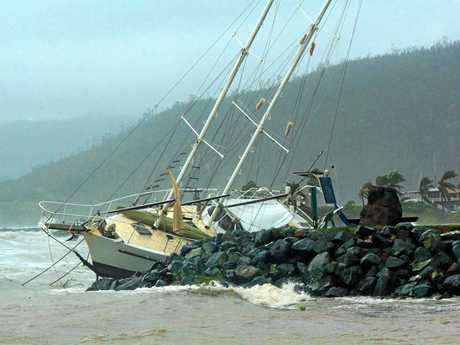 The category four tropical cyclone struck the Queensland coast near Airlie Beach on March 28 last year. Over the following week it caused wide-spread damage in Townsville, the Whitsundays, Mackay, central Queensland, Logan, the Gold Coast, Tweed, Ballina, Byron and Lismore, destroying homes, businesses roads and community assets over the following week. Communities in both states are still rebuilding and the insurance claims continue rolling in. The ICA says 95% of claims have been processed, with 89% coming from Queensland and 11% from NSW. A total of 64,951 domestic and 10,117 business claims were received in the 12 months since the storm hit Airlie Beach in March last year. "Policy holders are still lodging claims," Mr Fuller said. "But across the entire disaster area, more than 95% of residential building claims have been closed, almost every domestic motor vehicle and every domestic content claim has been closed." Mr Fuller said the claims that remained open were in the Whitsundays area due the remoteness, the damage done by extremely high wind speeds and the high number really old buildings. "The challenge there is that the damage tends to be greater, there may be more complex building works required and there can be issues about what was actually cyclone damage and issues around the age and quality of the building before the cyclone." Mr Fuller said while some claims remained "challenging" the insurers had responded extremely fast. Cyclone Debbie: the aftermath, Wednesday March 29.